The place I work at is a food blogger’s dream. Their merchandising department is so good at their job that almost any ingredient you see in a top-hit type recipe has a place on our shelves. Even so, there is always something that we won’t sell simply because it’s not trendy enough. Kasuri methi (dried fenugreek leaves) and chaat masala is nowhere to be seem but the haldi (turmeric) and jeera (cumin) jars always seem to empty quicker than they are filled. Whatever I can’t buy after work on Sunday forces me a little out of my comfort zone. During the store’s annual end-of-year spice cupboard restock sale (a name I just made up) last year, I took home some sumac, smoked paprika, ground ancho and chipotle pepper, red pepper flakes and powdered harissa blend, which little did I know, is like buying powdered recheado masala. It’s not the same. I haven’t quite dug into the sumac yet but from what I did learn so far, it’s like amchoor (dried mango powder) or anardhana (dried pomegranate seeds) adding tart or sour flavour to foods. It is the fruit of one of quite a few flowering shrubs called sumac and I’ve added it to my list of “who the f thought ‘let’s eat this’?” first. I bought a powdered harissa blend (pronounced with a thick “h” sound and said “heir-ree-sah”) because I’d read the name in a cookbook and saw it on a few blogs. I kind of figured it was one of those trends that caught on where food media takes specific stuff from west Asian/north African cuisine and then proceeds to turn their noses to the fact that everything is immigration. You know that one? But harissa is harissa regardless of the trend. As I went about my job, I came across a few people who were first generation Americans and who cooked with these same ingredients I wanted to learn about from not-the-Internet. So I asked questions. Their surprise at seeing the spices on display was akin to mine when I first moved here and shopped at this same store once in a while. They had the same eagerness to answer my questions so I made them smell the spices and asked them if it was just like home. Some were and as I expected, some spices would always smell better just by virtue of the hands that made them. I talked to one customer about making couscous from scratch (it’s cheaper, he said) and another about biryani and if I was Indian because he always got mistaken for one. He was Iraqi. We’re different but we have biryani in common. So I went back to my harissa powder and did what I knew best – I turned it into a paste albeit very, very unconventionally. What I discovered was that the foundation of most recipes that come from my country and other former colonies like Tunisia and Morocco and Iraq is the “masala”. It’s that “juice” or “sauce” made with a blend of spices and hot peppers to make this simple, otherwise bland food from these regions taste like a feast. I’m probably reading too much into this but I can’t help but see similarities between the techniques used in the kitchens in all these parts of the world I’ve already mentioned. I don’t doubt that some part of India has its own harissa-like paste and making a green version of this was my homage to that. Homage a.k.a stock-piling coriander/parsley/chillies. As you might be able to tell with a simple google search, I am not the first person to do this. There’s a reason I’ve mostly stayed away from glorifying ingredients and traditional recipes even from Goa. While it does benefit me when Bon Appetit says “USE CHAAT MASALA ON EVERYTHING” (because maybe someday it will be in a grocery store), it also definitely benefits BA and just like that its purpose is reduced to some sort of fashion statement. As immigrants – I’m new to this so correct me if I’m wrong – we’ve been happy to give away parts of our culture or who we are to better assimilate into societies. Our otherness can sometimes demand that we please all of the time. We let dominant media cherry pick in the hope that maybe they will see us as people who eat, drink, do jobs, live and breathe. I don’t hold a grudge so don’t rage for me. What I am is genuinely curious about all these new ingredients I hear about and what makes them more desirable than others. But I also don’t want to be that BA-type “must-use right now” even though I know only two people read my blog. It’s a huge responsibility, right, mama and other person? I don’t really expect people in America to understand Indian food in its entirety. Even I can’t do that. What I do hope is that we take time and care with whatever ingredients we do have a chance to use. I’ll never stop feeling incredibly lucky for the worlds that I see through my grocery store. I hope we never stop crossing borders to meet at the place we have the most in common – around the table. I’ve used mayonnaise to make this marinade but if you’re not into it, use any yogurt (vegan, Greek etc) or leave it out completely. In the recipe for the green harissa, feel free to use pre-ground spices if you have them or if it’s easier for you to purchase them that way (not everyone has spice-grinding tools). You can make both elements in this recipe a day or two ahead and they will taste even better the next day. 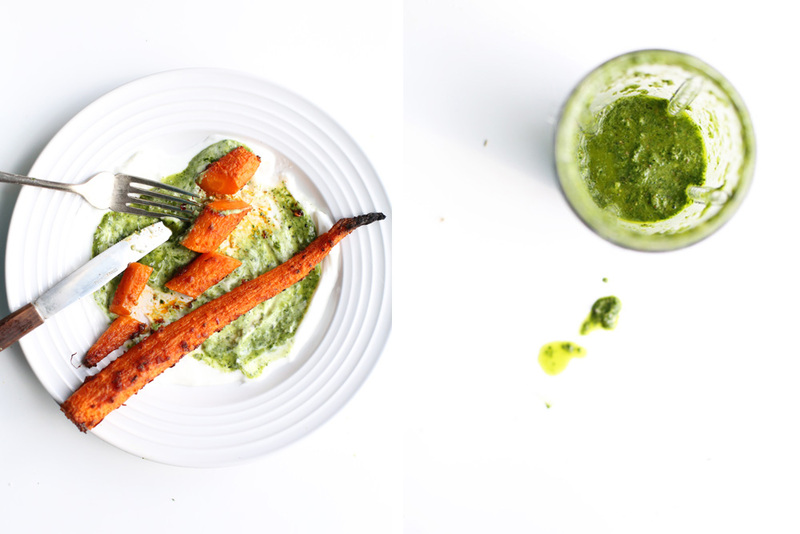 The green harissa goes well with breakfast, lunch and dinner on everything. Use often. 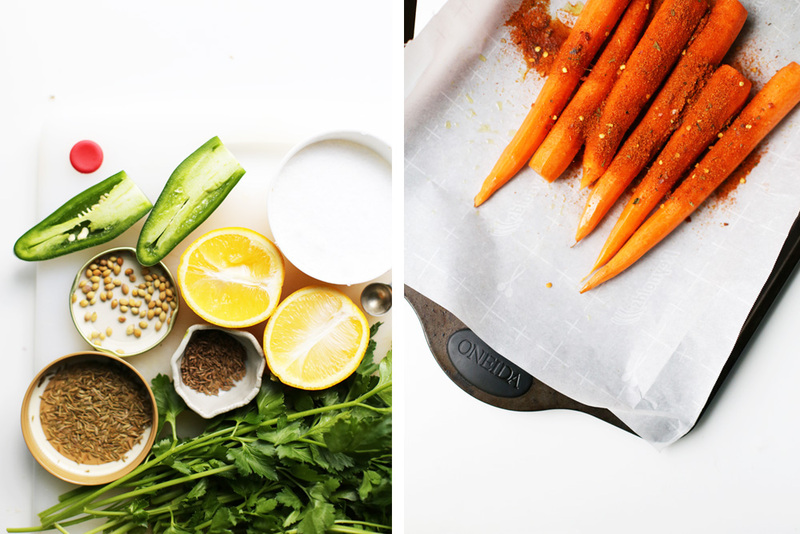 Heat the oven to 400 degrees F and line a baking sheet with parchment paper. Lay the carrots on the baking sheet and drizzle the olive oil over them. In a small cup, mix the mayonnaise, harissa and salt and spoon them over the carrots. 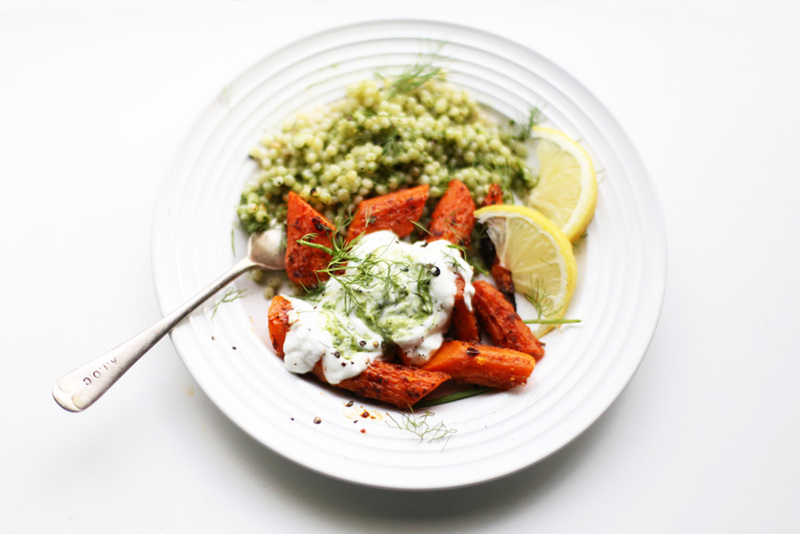 Using your hands, rub the marinade all over the carrots to coat them completely. Place the carrots in the oven for 1 hour, turning them over at the 30-minute mark so that they can brown on both sides. Take the carrots out of the oven and cut them into bite sized pieces, if you wish. 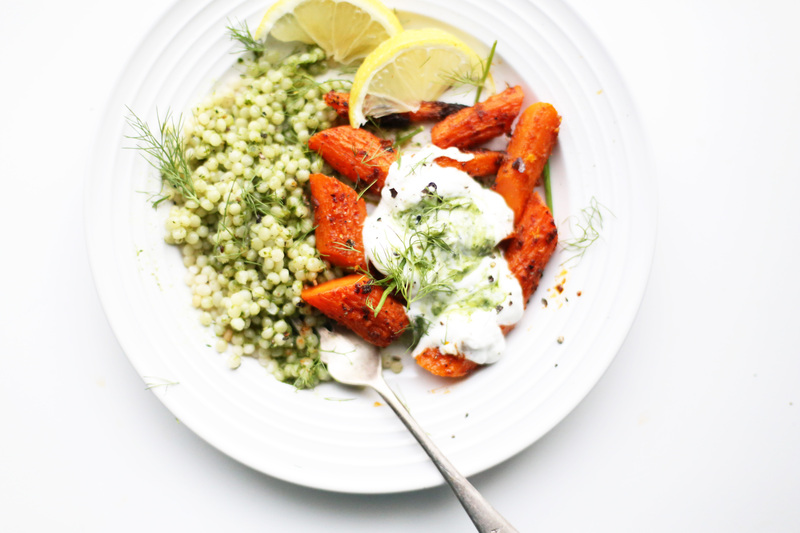 Serve or toss the carrots with lots of green harissa (recipe below) and yogurt or toss it in with couscous on the side. Or do both! 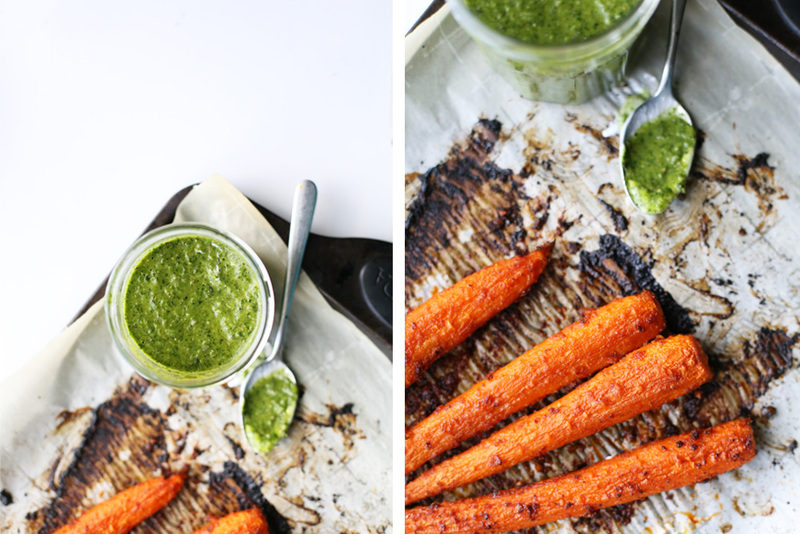 While the carrots are roasting, make the green harissa. Heat a dry skillet on medium heat. Add the spices to it and toast them by stirring them around until they start to smell fragrant and change colour slightly. This should take 1-2 minutes. Once you start to smell them, take the skillet off the heat and grind them to a powder in a spice grinder or mortar and pestle. Place the parsley, cilantro, jalapeno, garlic, lemon juice, olive oil and ground spices into a food processor or high speed blender and grind until it all turns into a smooth paste. Taste the paste and season with salt and pepper. Scoop it into a jar. It should keep well refrigerate for up to a week. I love reading your blogs Edlyn – your thought processes are so original and enlightening – you say things that we just thought but never verbalized. Even as an ‘old’ immigrant (41 years away from my first home) I appreciate your writing and can relate! Keep it up. I usually forward this blog to others, so there are more than the two you say read your blog!